HistoricBridges.org offers professional detail-oriented photo-documentation, information, and preservation advocacy for all types of historic bridges except covered bridges. HistoricBridges.org is authored by Nathan Holth. Click Here For The Latest Website Update (4-5-19). Featuring photo-documentation and narratives, the Bridge Browser offers photo-documentation and narrative discussion for thousands of selected historic bridges. 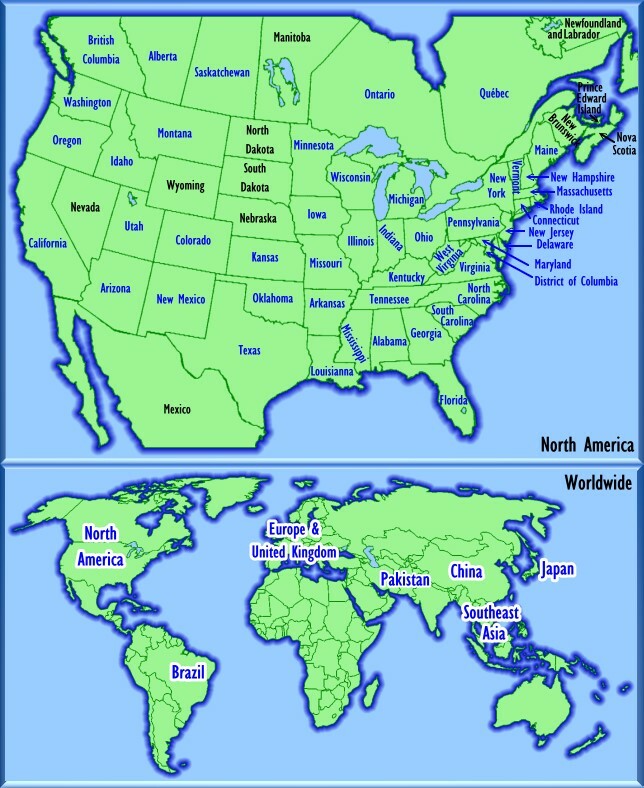 Although selected bridges from around the world are listed, the Bridge Browser focuses on North America. Places listed in blue on the interactive map below have bridges available. The BridgeSeek search tool, is also available. This link has new and under-construction pages. There are currently 5246 bridges available in the Bridge Browser. Porter County Bridge 1013	 Rural: Porter County, Indiana	 A good example of a state standard plan truss bridge, this bridge is closed to traffic, with a modern bridge and larger highway nearby. Informative presentations designed to introduce viewers to the world of historic bridges. Utilizing photos and diagrams, the various terminology, construction, and configuration of historic bridges is discussed. A presentation on inspecting historic bridges is also available. This page also features some formal, yet easy-to-read, essays that further explore the historic bridge world. - Downloadable presentations previously given by HistoricBridges.org. - A discussion of Michigan's ornamental "Type R4" bridge railing. - An in-depth look at curved chord through girder bridges. 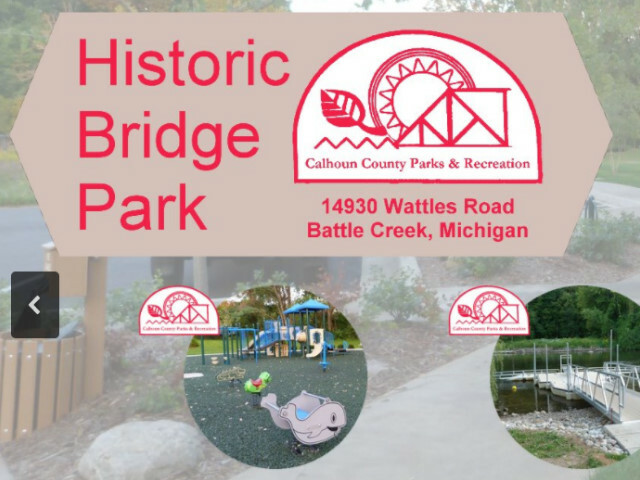 A comprehensive visitor's guide to this unique park located in Calhoun County, Michigan whose focus is the restored metal truss bridges within the park. 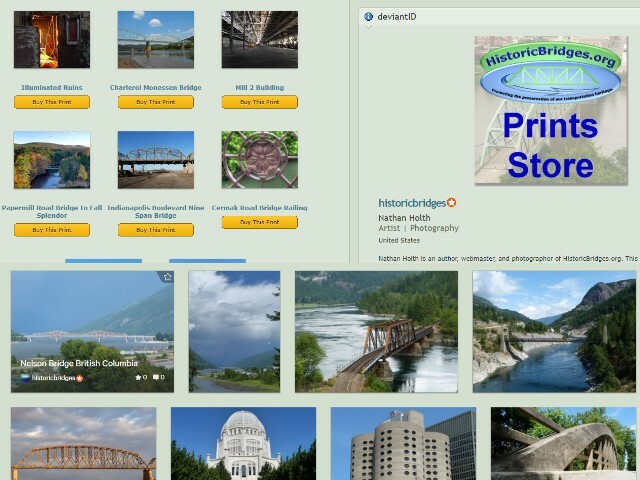 Contains maps, photos, and links to bridge browser pages for the historic bridges within the park. The Prints Store is where you can purchase quality prints of selected photos from HistoricBridges.org taken by Nathan Holth. Photos are organized into folders by state/province. Don't see the bridge and/or photo you would like a print of? Contact us and let us know what photo you would like and we will upload it to the store so you can purchase your prints. 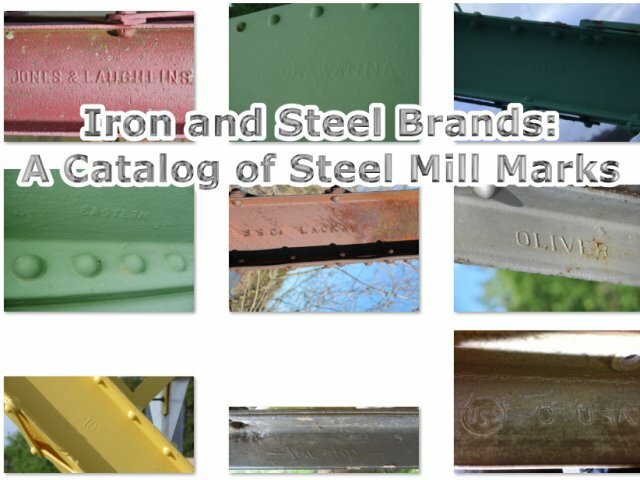 This is a one-stop photographic catalog of the names of steel mills found on bridges in the United States and around the world. The wording and design of these mill marks/brands changed over the years and in some cases can assist in dating the iron/steel materials on a bridge. Features a collection of external links to other bridge websites on the Internet. Many other bridge enthusiast websites feature bridges from areas not covered by this website, and links to those websites can be found here. 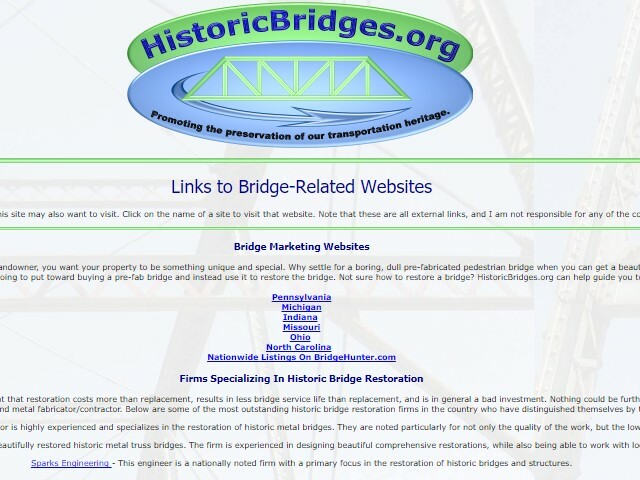 Additional code improvements have been made, particularly to the very old Historic Bridges Encyclopedia, and these pages have been updated to match the site template in use everywhere else. These also were the last active pages on the website to not meet mobile browser standards. Mobile users, which today make up a majority of website traffic to this website, should enjoy a more consistent experience throughout the website. Visitors hopefully will not notice any changes whatsoever, but behind the scenes we had to update some of our code to be compatible with the latest version of PHP. If you notice something is not working, please contact us. This marks the completion of the Oregon update. HistoricBridges.org is now proud to provide full coverage of the majority of historic bridges on the famous Oregon Coast Highway and in Portland, as well as selected coverage of the top historic bridges elsewhere in the state. Most of the top historic bridges in Oregon are now on HistoricBridges.org. Limited coverage of Southeast Asia has begun with the introduction of the famous Long Bien Bridge in Vietnam. More bridge listings for Vietnam and eventually Thailand are planned. About half of a large update to greatly expand this website's coverage of Oregon is complete. This first half of the update focused on providing coverage of the remaining major bridges in Portland, major bridges of the Oregon Coast Highway (US-101), and high significance bridges along the I-5 corridor. The second half of this update will commence halfway through December and will fill in some additional coverage in the counties added as part of this update. New Website Feature! The Historic Bridge Foundation has developed a Historic Bridge Finder Smartphone app which uses HistoricBridges.org Bridge Browser database. Click here to learn more. 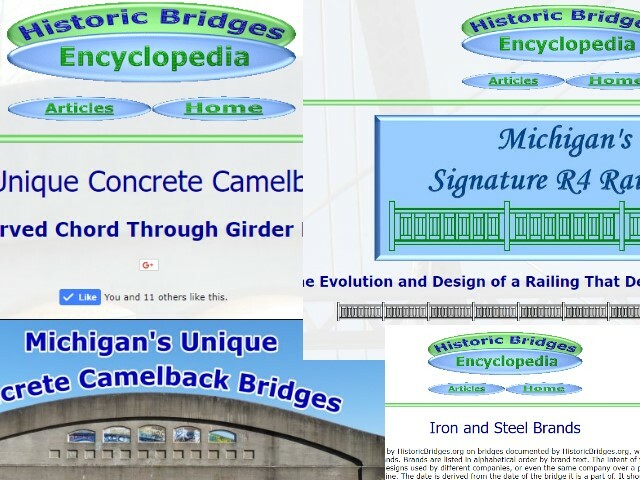 Many historic bridge resources online are not designed with mobile users in mind. 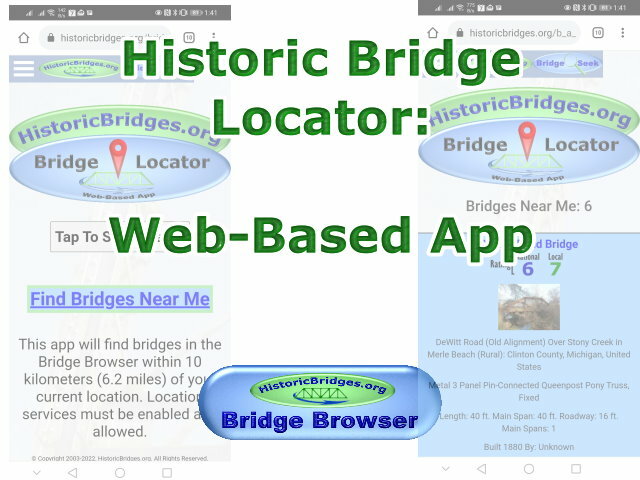 HistoricBridges.org and the Historic Bridge Foundation are proud to continue to lead the way in offering a mobile-optimized experience for historic bridge enthusiasts with the release of this app. December 20, 2017 - Global Coverage Enhancements and Additions, and Ongoing Additions in USA. The website has been slightly redesigned to better support overseas bridge entries. Several years ago the website was expanded to include less than a handful of bridges overseas, mostly as a test, using guest and Creative Commons photos from the Internet. This year, actual HistoricBridges.org trips have taken place including in China and eastern Europe. Thus, the "testing" of overseas coverage has ended, and the website design tweaks will ensure the website will fully support bridges added from any coverage. To inaugurate this redesign, two bridges from China have been added. Look for a handful of additional bridges in China as well as bridges in eastern Europe to be added in 2018. Also, additional overseas trips are planned for 2018 which will ultimately further expand global listings on HistoricBridges.org. HistoricBridges.org global coverage is not planned to be extremely extensive or to overshadow the primary coverage areas of the United States and Canada. However, it is intended that the global coverage will help highlight some of the noteworthy historic bridges beyond the North American borders, and also create a sense of context in a global sense for bridges in North America. Back in North America, bridges are being added from a variety of states and provinces, and this process continues. Ultimately, a lot of high significance bridges from a variety of states will be added, and better coverage for the states of Illinois and Virginia will be introduced going into the new year. Chicago's Bridges Book Now Available! By Nathan Holth, author of HistoricBridges.org, this book provides a discussion of the history of Chicago's movable bridges, and includes a virtual tour discussing all movable bridges remaining in Chicago today. The book includes dozens of full color photos. Looking For A Pedestrian or Light Vehicular Bridge? Whether you are a park, trail organization, college, city, or private landowner, you want your property to be something unique and special. Why settle for a boring, dull pre-fabricated pedestrian bridge when you can get a beautiful historic bridge to do the same thing? Many states maintain a list of bridges which you can acquire, relocate and restore, and other individually listed opportunities often are available. These bridges normally can be acquired free of charge, so use the money you were going to put toward buying a pre-fab bridge and instead use it to restore the bridge. Not sure how to restore a bridge? HistoricBridges.org can help guide you to people and firms that can help, or you can just get in touch with Bach Steel. Note: these bridges will be demolished if nobody acquires them. The Historic Bridge Foundation works to encourage government agencies and officials to preserve historic bridges, the Foundation provides consultation and guidance to individuals and groups seeking to preserve historic bridges. The expertise available at the Foundation is evidenced by the fact that HistoricBridges.org frequently refers people to the Foundation for further assistance beyond what HistoricBridges.org itself provides. If you have any questions about why a donation to the Historic Bridge Foundation is worthwhile, feel free to contact HistoricBridges.org. 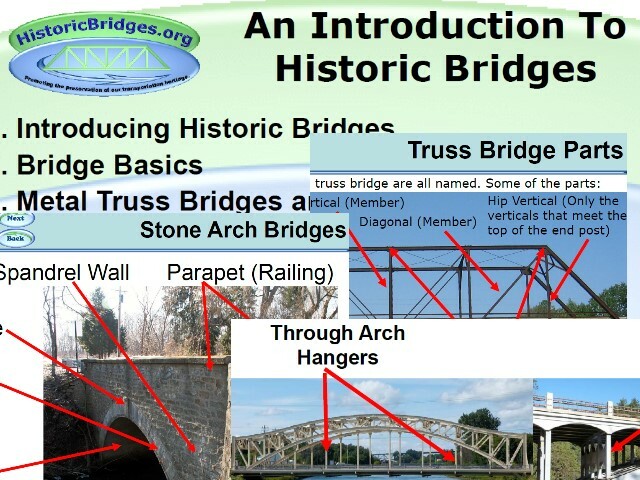 Alternatively, learn more about the Historic Bridge Foundation at their website www.historicbridgefoundation.com.